Girl Scout Animal Shelter Benefit Drive a Success! 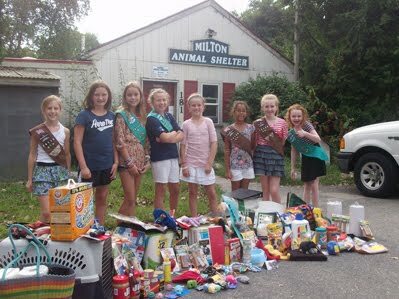 The Boston Globe reports that girls in Junior Girl Scout Troop # 74135 recently conducted their second annual drive to benefit the Milton Animal Shelter. Members made and sold animal-themed jewelry and zipper pulls, decorated drop boxes for donations throughout the town, and conducted doorstep drives for pet supplies in their own neighborhoods. Thanks to the generosity of many people, the drive was a huge success. The girls visited the shelter last week to drop off the donations, and have decided to continue their efforts. Anyone interested in supporting the cause can buy the troop’s craft items at the farmers market.